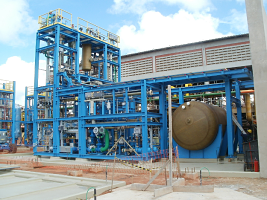 thyssenkrupp Industrial Solutions’ modular skid mounted chlorine plants offer a cost-effective and practical solution to industries on the African continent who require small chlorine alkali plants for applications such as water treatment and mineral processing. While on-site chlorine production presents a better alternative to import, Bassett warns that setting up a chlorine plant presents its own challenges. Construction costs can sink a project and this is where our modular approach presents the simplest, fastest and most cost-effective solution for facilities that are remotely located and have limited engineering capabilities and staff resources. Chlorine is produced through the process of electrolysis (the passing of an electric current through brine (sodium chloride (NaCI) or common salt dissolved in water), with salt as the feedstock. Two co-products that result from chlorine production are caustic soda (sodium hydroxide, NaOH) which is an alkali and hydrogen (H2) which is a combustible gas. In the modular solution, electrolysis is built on multiple skids that fit into 40 foot containers that can be easily, quickly and cost-effectively transported to site. “Our modular engineered solutions have innovated processes through simplification,” comments Bassett. Designed and manufactured by thyssenkrupp Uhde Chlorine Engineers of Milan, Italy, skid mounted chlorine plants are made of a different functional skid groups such as brine filtration, brine super purification, and sodium hypo production. In addition to new plants, these group modules can be installed in existing facilities for modernisation and debottlenecking. “Once a plant is operational, we continue the partnership with our customer through our full service offering that includes ongoing training and after-sales support,” concludes Bassett. Today there are skid mounted chlorine plants in operation in Europe and South America, and Bassett confirms that they are currently working on a feasibility study for the development of a plant in South Africa.